I finally had a few moments to look through the pictures from Saturday’s pick-your-own at Bartlett’s. It was overcast and spitting rain drops off and on all day, but we couldn’t have had a better time. This year the tomatoes were far from the road, which meant hay rides to the field and back. I wasn’t sure how Nora would feel about climbing aboard a strange and noisy contraption. She’s often slow to approach new situations, but in this instance there was no fear. Nora was thrilled to go for a “tractor ride” and to ride past the different crops on the way out to the tomato fields. We “oohed” and “awed” at neat rows of broccoli, summer squash, corn, and pumpkins on our way to out to more beautiful tomato plants than one can imagine. As soon as we found our way into a good looking row, Nora set to work… eating. Of course, she picked tomato after tomato, and a few even made it into the bags, but mostly she gorged herself on her favorite vegetable. 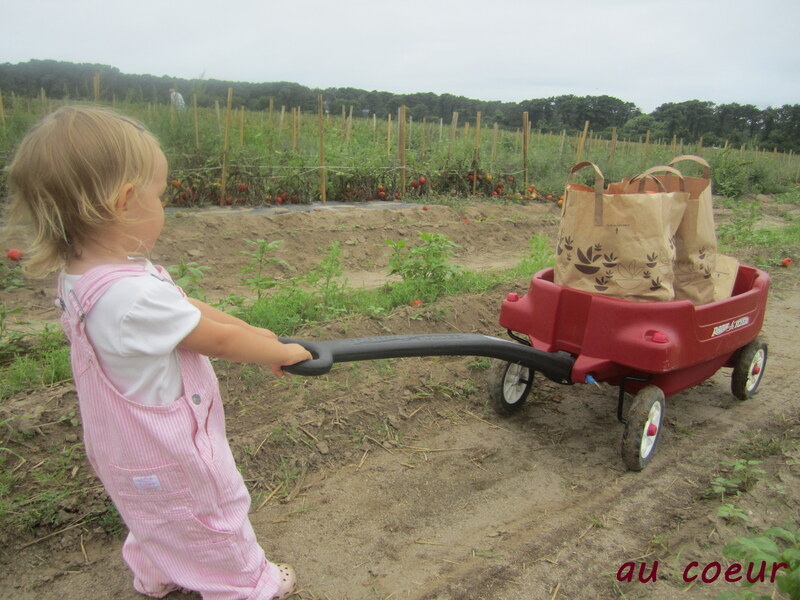 Between all of the berry and vegetable picking we’re doing and gardening for our CSA with Hummock Pond Farm, Nora is becoming quite the little farmer. She loves to dig around in the dirt, to pull weeds, and most of all to harvest. I’m so glad that we’ve discovered this part of Nantucket. Last summer felt pretty barren without the local foods, but now I know I just wasn’t looking in the right places. By the time we were done, the wagon was loaded to the brim and overflowing. She tried her best to pull it, but even with her often surprising strength couldn’t manage the 88 lbs of vegetables, so I filled up her bucket and she happily trotted back for another tractor ride toward home. As I’ve mentioned, though the work was done for Nora, picking the tomatoes was only the beginning for me. It took about nine hours over two days (six the first day, three the second) but I managed to put up nearly all that we picked. Eighty-eight pounds of tomatoes yielded me 41.5 quarts crushed tomatoes: 6 quarts orange heirloom, 9 quarts yellow, 9 quarts and 7 pints roma, and 14 quarts field tomatoes. I left a few out for eating this week — most especially for making a tomato pie for tonight’s dinner (if you haven’t had one of these you must make one now!!) — and we have a giant bowl of cherry and grape tomatoes just for munching. I think we’ll be set for a while. I really enjoy the canning. It’s work that easily feels like me-time and I feel so accomplished when I’m done and have rows of beautiful jars to stare at. The only other thing I’ve made this year is strawberry jam, but over the next month I’m planning on preserving peaches and plums, and making peach, plum and grape jams, as well as apples three ways: butter, sauce, and spiced rings. I always process and freeze a couple pumpkins, too, so I don’t have to buy the canned version for fall/winter pies and baked goods. I was thinking my might add a post or two about how to preserve; maybe more with step by step recipes if there’s interest. Would anyone be interested in reading that? My goodness, those jars of tomatoes are impressive! So vibrant and beautiful, and how nice that you’ll have such wonderful fresh food through the winter! I am personally afraid of canning, though I’ve heard I shouldn’t be, and it’s the one thing in the kitchen I’ve yet to try. If you post instructions on preserving I would love that! Very interested in your canning recipes! Just trying my hand at it this year, so far I’ve canned some tomato sauce and cabbage soup (in a pressure canner). TIA! The photo of the jars is so pretty! Love the colors. I would love it if you would post more about canning and preserving – it’s something I definitely want to learn how to do. Amber, you’ve done fantastic once again! You are such an enterprising young mother! Very admirable. I’m sure Nora had a great time out in the fields with you. You will make a big savings in your food budget and have such tasty tomatoes year round. You should feel good about what you’ve done! Thanks for sharing all the beautiful pictures. Glad you fared ok with Irene in beautiful Nantucket. We were busy here on the Chesapeake in Maryland, but the weather is beautiful now! Thank you all for the kind comments. I’ll plan a tomato recipe for this week and see if I have enough photo to share my strawberry jam recipe as well. Kim, I am so jealous of your pressure canner! That is on my wish list of things to buy some day. For now I stick to boiling and (unbelievably) this is only the first year that I’ve had an official canning pot with jar rack — for the four years before this, I was rigging up a giant stock pot to boil on a couple jars at a time. Oh, your daughter is SO CUTE! Our neighbors just gave us a bunch of tomatoes. Your post inspired me to make some homemade sauce!